In order to meet the demands of rapid growth in our community, Pacific Centre Family Services worked diligently to secure funding for the construction of the beautiful new Centre for Wellbeing at 324 Goldstream Avenue. Since 1968, Pacific Centre Family Services Association (PCFSA) has been promoting dignity and quality of life for families and individuals across Greater Victoria, especially on the West Shore, through education, counselling and creative programming. The Centre for Wellbeing provides 15,000 square feet of program space, all based on trauma-informed design for service excellence. PCFSA provides services on the second floor, with 7,200 square feet of street level space for rent by other health and wellness professionals. Also proposed are 104 units of affordable housing for low-income adults, through the Greater Victoria Housing Society. The two-acre property backs directly onto the West Shore Child, Youth and Family Centre on Wale Road, making it easy for families accessing services at both centres. 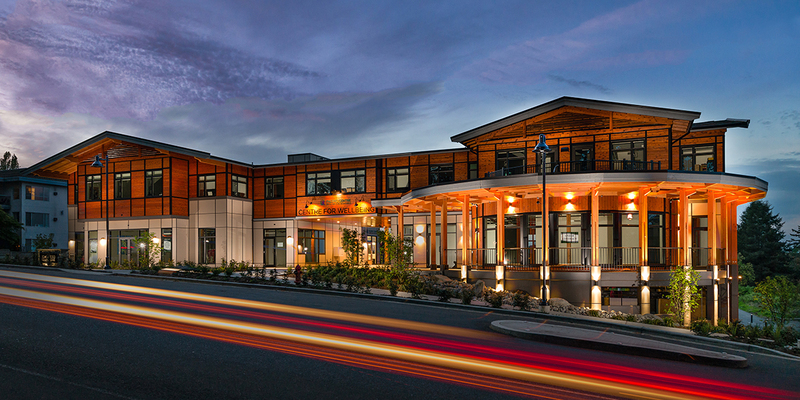 The Centre for Wellbeing was recognized as the best new community-institutional building in 2018 by the Victoria Real Estate Board. Inside, clear wayfinding and private, easy-to-find entrances make the building feel safe and welcoming for those who benefit from the services of Pacific Centre Family Services Association. The non-profit organization provides vital mental health and wellness services for youth and families in our community. The exterior is warm and inviting as well. Expansive gable roofs emulate both First Nations long houses and 20th century bungalows. Cedar siding and exposed fir timbers celebrate the west coast and the local tradition of craftsmanship. Extensive landscaping helps to create an atmosphere of beauty and tranquility. While the centre was made possible through funding from the sale of another building, it did not cover the cost of the whole project or of the services provided by PCFSA. Funding is being sought from all levels of government, businesses, foundations and the public. If you or your organization would like to be involved in supporting wellness on the West Shore, please contact PCFSA at (250) 478-8357 or see our Donate Now page for more options.